Kitchen remodel included pre-finished, 1 by 6 T&G Pearwood flooring. The last posting discussed “How to Choose Countertops”. This one will be reviewing flooring options. Kitchens are high traffic areas; are subject to liquid spills and crumbs, everything from popcorn kernels (hard to round-up all the little rolling things) to bits of veggies that escape during prep work. A floor that tends to resist stains and is easy to clean is important. Dishes and glasses get accidentally dropped as well. Some materials are more resilient than others. One of the most inexpensive flooring options, it comes in a wide range of designs and finishes. It is available in sheets or tiles and is made to look like stone, wood, ceramic tile and more. It is easy to clean and comfortable to stand on. The best choice for kitchens is sheet vinyl, as every seam is a potential failure point and will wear faster. It is recommended to select vinyl with less embossing, as the texture tends to trap and hold dirt, making them hard to clean. Strong sunlight can fade it, and moving heavy objects such as refrigerators can tear the material; protection must be used. Cost for installed vinyl is comparable to longer lasting materials. Uninstalled costs are about $1 to $5 per square foot. An all natural material made from linseed oil, resins, wood flour and more, it has green credentials and a retro-look. It is affordable, durable, and easy to maintain. It can wear and fade with time and use. It is better to get linoleum that the manufacturer has added a protective coating; without this, the floor will need periodic waxing and polishing. Cost is about $4 to $7 uninstalled. Made of linseed oil and natural materials, the colors tend to be earthy to retro bright. It is much more resistant to damage than vinyl. It is an extremely long-lasting floor. It does need to be waxed and periodically stripped to maintain a cleanable shine. Two Forbo production facilities in the Netherlands and Scotland produce Marmolem, and Armstrong is making it as well. Cost is about $3 to $8 per square foot, uninstalled. Select material with no grooves for an easy to clean wood floor. Grooves catch spills and hold things like sugar and are very difficult to maintain. Hardwood flooring can be either pre-finished or finished after installation. Pre-finished flooring wears longer and the installation is quicker, plus the cost of installation is much less. Liquids can cause damage if they’re not wiped up right away. Wood dents and scratches easily, so it will need periodic refinishing. The cost is about $5 to $12 per square foot, uninstalled. Tile and stone floors are beautiful in the right setting and appropriate on the right substrate. Color and texture choices are endless. Most tile floors are installed with a substantial grout line that creates a cleaning problem and an uneven surface. This can be a safety issue. Items dropped on a tile or stone floor will break if they are breakable and the hardness of the materials make them uncomfortable for standing any length of time. If you like to walk about barefoot in the kitchen, they will feel cold. Tile flooring runs between $3 to $8 per square foot, and stone about $15 to $30 per square foot. Concrete is virtually indestructible and it can be stained, stamped, scored or acid etched for added style. However it must be sealed to prevent stains, and as with tile and stone, it is uncomfortable to stand on for long period of time. It stays cool even in hot climates, so it great for that; not so much here in Bellingham! Costs for uninstalled range from $2 to $15 or more per square foot depending on the finishing you want, and you will need professional installers for this product. What is the best material for your bath flooring? 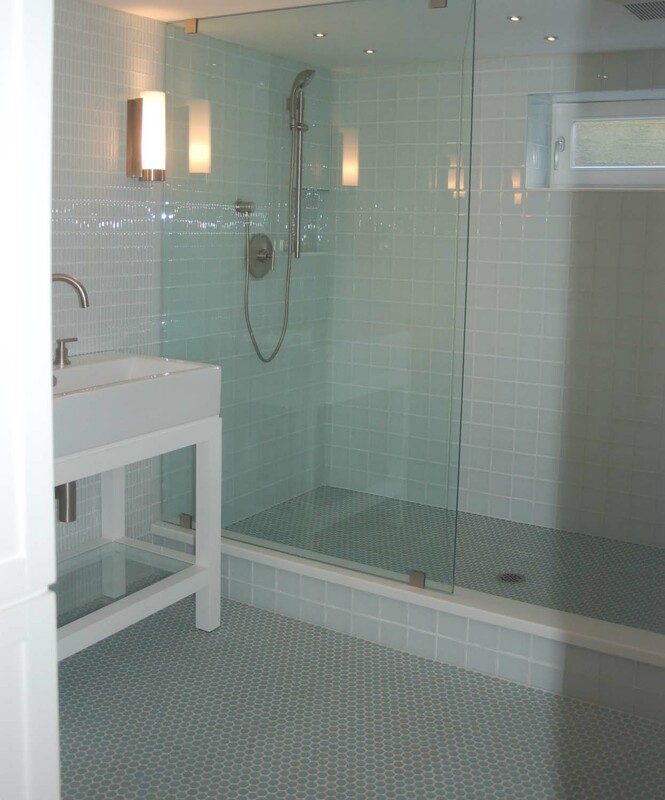 This homeowner really liked the look of white, glass tiles! There are a great many options for flooring, most of them OK, but some are better than others, based on cost, comfort and appropriateness for a wet environment. I came across an excellent article in CASE Handyman & Remodeling that compares pros and cons of 7 bathroom flooring types. I’ll list them here, and you can go to the website to get full details. 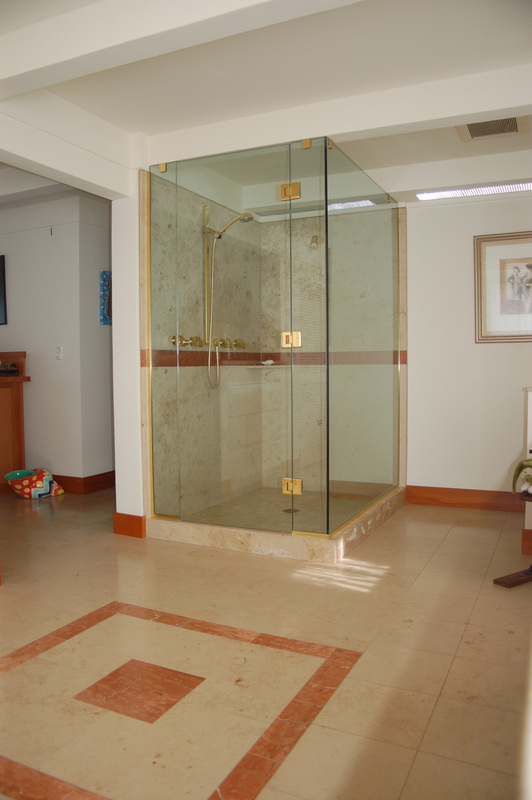 Tile (ceramic and glass): Durable, inexpensive and water resistant. They can be slippery, pick a tile that has a textured surface. Stone: Also durable, water resistant and beautiful. To avoid slipping when wet, look for the textured stone. This material is the most expensive. Vinyl: Comes in sheets or tiles, lots of colors and patterns. Very inexpensive. Beware of tiles, as moisture can get between them. Laminate: Made of layrs of resin-impregnated paper and compressed wood chips. Can be printed to look like stone, slate, wood or whatever. Hardwood: Must be treated with layers of polyurethane. Engineered wood is lower maintenance. Bamboo has been recommended as an environmentally friendly alternative to traditional wood flooring. It grows far faster than trees and so can be harvested far more frequently than the 40 year span most trees require to mature. Build Direct is the website where this information can be found in greater detail, and with more selections of colors to choose from for bamboo flooring. Tile or hardwood for the bathroom floor? How does it feel with bare feet? How does it stand up to moisture? Ceramic tile. Provides a rich, solid feeling; waterproof and not too expensive; it cleans up well and resists small pools of water. Sheet or tile vinyl. Waterproof, inexpensive, easily installed. Comes in sheets or tiles. Stone. No moisture problems; is great, but very expensive. Must be textured or can be very slippery. Engineered wood. Has a plywood base that stands up well against moisture, and the top layer is real wood. It is best for the wood look. Laminate flooring. 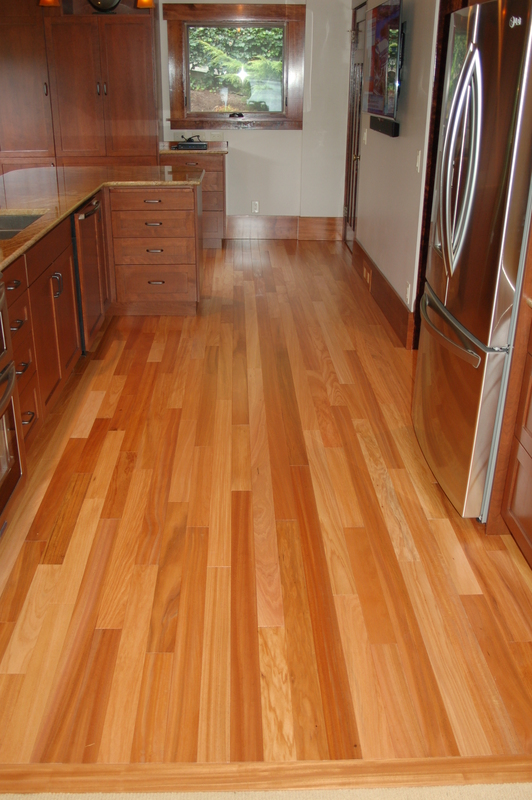 Red Oak laminate is most popular for wood or wood-look flooring. Pine laminate is also a good choice, as it reflects light well and has a cleaner look. Tuscan stone terra laminate will give your bathroom a richer look. 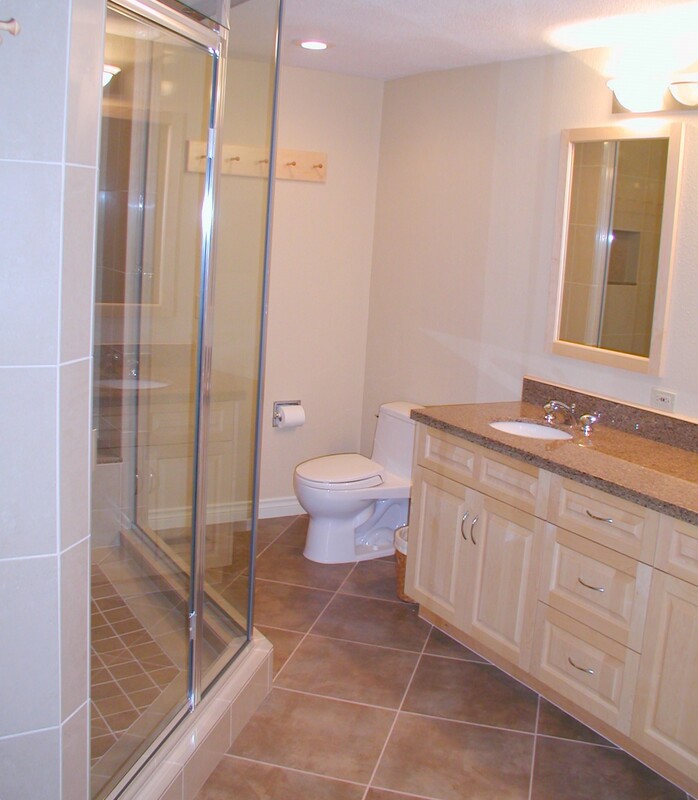 Another pattern is Travertine laminate, a lighter colored stone product. Solid hardwood. This product looks good and feels warm on the feet, however unless it is perfectly installed, there is danger of moisture getting into cracks and causing problems. Must hire a professional to install. Carpet. The worst possible choice for a bathroom, for obvious reasons! That said, there are a lot of carpeted bathrooms out there. Select water, mildew and stain resistant carpeting. Materials include, but are not limited to carpet, tile, laminate and engineered wood. Selection of the best material must include the amount of traffic you expect and moisture. Basements are notorious for moisture problems. “Basement Ideas – how to select the best flooring for your basement” is an excellent article that reviews the pros and cons of the basic types of flooring available. “Laminate and engineered flooring are very beautiful and look great in a basement. The material and installation is more expensive than carpet but usually cheaper than using a ceramic tile.” The basement floor must be very level and smooth for proper installation of laminate and engineered flooring. There it is – check out the full article for mor pros and cons on the materials. The above photo is from Lynden Floor Design – they have an incredible array of flooring materials and expertise. The small patterned floor tiles blend well with the classic style of this bathroom. Below is another bathroom floor tile layout. The warm colors make this particularly inviting on a cold Northwest winter! 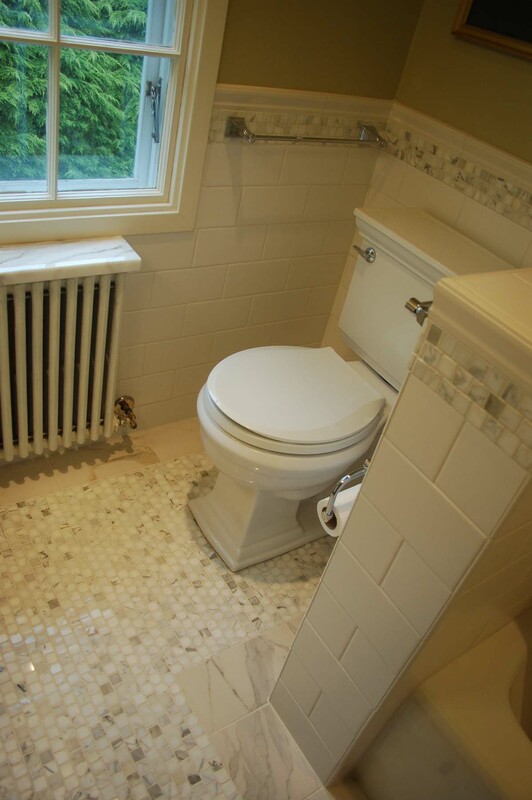 The last photo shows a unique blend of 3 tile patterns to achieve an overall look of an white-on-white bathroom! You are only limited by your imagination when it comes to flooring and walls! Don’t forget the beauty of natural wood floors – my personal fav when it comes to halls and living rooms.